BEFORE: For the next week or so, movie marathon will consist of a potpourri of films as the countdown to the big horror chain for Halloween continues. And comedy is the genre of the day as Silver Linings Playbook makes its way into the list of advanced screening films. The film features marathon newcomers Bradley Cooper and Robert De Niro in addition to veteran Jennifer Lawrence (last seen in Winter’s Bone). 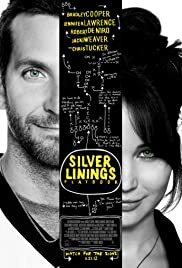 AFTER: The title of the film is Silver Linings Playbook so it’s no surprise that much of the film is spent being optimistic or hoping for silver linings. Pat Solitano (Bradley Cooper) found his wife cheating on him which caused a chain reaction that led him to a mental institution. The film begins with him leaving and returning home trying to fit back into society and rectify his marriage. The film does have a lot of silver linings. De Niro gives a fantastic performance and Cooper and Lawrence are able to steer the ship to great heights. Humor was also sprinkled throughout with a great balance between comedy and drama; neither overshadowing the other. But it wasn’t all silver and gold; there was some coal here and there. The most obvious example being the supporting characters. Pat and Tiffany (Jennifer Lawrence) are at the center of the film but, as with any other film or story, there are a bunch of supporting characters to flesh out plot and development. My problem lies in the balance between the main and the supporting stories. After Pat meets Tiffany, it’s like his family disappears for the most part. Sure, every few scenes you see Pat’s father (Robert De Niro) jump in and ask why he can’t watch the football game with him, but other than that, it’s the Pat and Tiffany show. Obviously most of the time should be spent on their developing relationship, but the family is still there hanging on for dear life. The way they’re shown in the film is completely unnecessary until the end when they act as the big deus ex machina to give a way to close the film. Rant aside, Silver Linings Playbook was an above average romantic comedy. David O. Russell, who directed The Fighter two years ago, shows he has many other talents. It would be a good choice to see in the theaters, but it may be a difficult choice depending on how good the other big November releases, like Skyfall, Flight, and Lincoln are in comparison. Silver Linings Playbook opens in theaters on November 21.